Los piratas del Riff. Imagen: Calendario de Ortiz de la Vega. I am now a good way within the Body of Spain, at Barcelona, a proud wealthy City, situated upon the Mediterranean, and is the Metropolis of the Kingdom of Catalonia, called of old Hispania Tarraconensis. 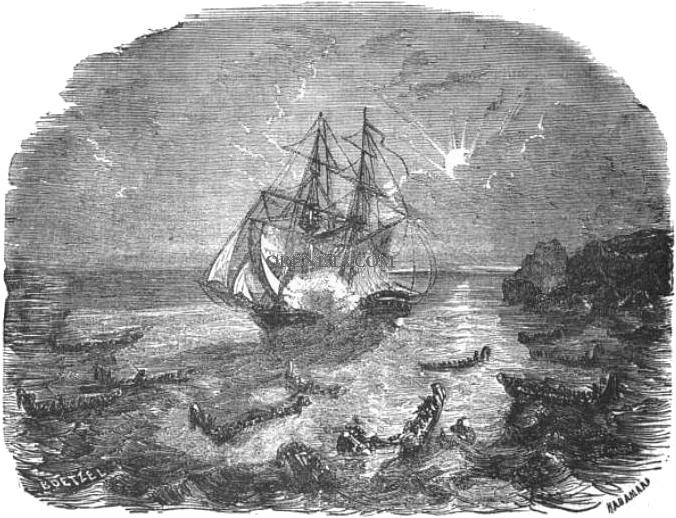 I had much ado to reach hither; for besides the monstrous Abruptness of the Way, these Parts of the Pyrenees that border upon the Mediterranean, are never without Thieves by Land (called Bandoleros) and Pirates on the Sea-side, which lie sculking in the Hollows of the Rocks, and often surprise Passengers unawares, and carry them Slaves to Barbary on the other Side. The safest Way to pass, is to take a Bordon in the Habit of a Pilgrim, whereof there are abundance that perform their Vows this Way to the Lady of Monserrat, one of the prime Places of Pilgrimage in Christendom: It is a stupendious Monastery, built on the Top of a huge Land-Rock, whither it is impossible to go up or come down by a direct Way, but a Path is cut out full of Windings and Turnings; and on the Crown of this craggy Hill there is a Flat, upon which the Monastery and Pilgrimage-place is founded, where there is a Picture of the Virgin Mary sun-burnt and tanned, it seems when she went to Egypt; and to this Picture, a marvellous Confluence of People from all Parts of Europe resort. As I passed between some of the Pyreney-hills, I perceived the poor Labradors, some of the Country People, live no better than brute Animals, in point of Food; for their ordinary Commons is Grass and Water, only they have always within their Houses a Bottle of Vinegar, and another of Oil; and when Dinner or Supper-time comes, they go abroad and gather their Herbs, and so cast Vinegar and Oil upon them, and will pass thus two or three Days without Bread or Wine; yet they are strong lusty Men, and will stand stiffly under a Musket. There is a Tradition, that there were divers Mines of Gold in Ages past amongst those Mountains: And the Shepherds that kept Goats then, having made a small Fire of Rosemary-stubs, with other combustible Stuff to warm themselves, this Fire grazed along, and grew so outrageous, that it consumed the very Entrails of the Earth, and melted those Mines; which growing fluid by Liquefaction, ran down into the small Rivulets that were in the Vallies, and so carried all into the Sea, that monstrous Gulph which swalloweth all, but seldom disgorgeth any thing: And in these Brooks to this Day some small Grains of Gold are found. The Viceroy of this Country hath taken much Pains to clear these Hills of Robbers, and there hath been a notable Havock made of them this Year; for in divers Woods as I passed, I might spy some Trees laden with dead Carcasses, a better Fruit far than Diogenes’s Tree bore whereon a Woman had hanged herself; which the Cynic cried out to be the best bearing Tree that ever he saw. Yours to dispose of, J. H. Barcelona, 24 Nov. 1620. James Howell, Epistolae Ho-Elianae: Familiar Letters Domestic and Foreign (1754). Pirineos (5) Los Pirineos, o el Pirineo como prefieren denominar sus habitantes al referirse a una parte o región de éstos (español: Pirineos; francés: Pyrénées; catalán: Pirineus; occitano: Pirenèus; aragonés: Pireneus/Perinés; euskera: Pirinioak o Auñamendiak), son una cordillera montañosa situada al norte de la península ibérica, entre España, Andorra y Francia. Washington Irving: los encantos de las torres de Gracia, etc.